The study, co-authored by Scott Nystrom of REMI and Patrick Luckow of Synapse Energy Economics, Inc., excludes certain value calculations regarding climate impacts and over-the-horizon clean energy technologies, which are not yet understood in adequate detail or integrated into tested models. The reason for this is that the study is intended to focus on what can be measured about the strictly economic impacts that will flow from a revenue-neutral tax policy change; adding hard-to-quantify costs and benefits would dilute the analysis and lead to less precise results. If the study had included the high costs of ongoing climate destabilization or the high economic efficiency gains of breakthrough clean energy technologies not yet on the market, those more detailed calculations would attach greater economic efficiency to the pricing of carbon emissions. By not counting those costs and benefits, the REMI study provides a much more conservative but also more precise reliable resource for estimating the economic benefits of the carbon fee and dividend plan. 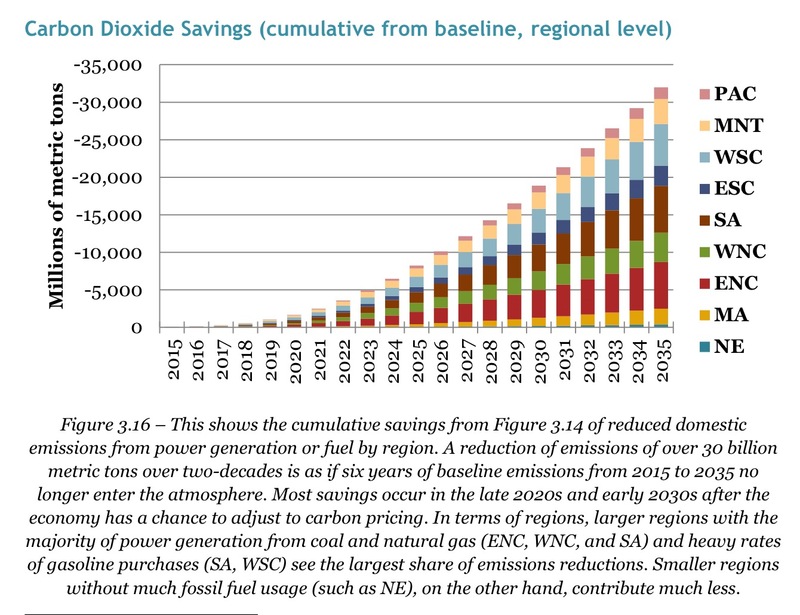 By way of example, had the escalating costs of chronic pervasive drought or major crop failures been counted in the baseline scenario (with no policy change), major emissions reductions would have a much higher payoff in the alternative scenario (the one where fee and dividend is implemented). Also, evidence is mounting that methane release from new drilling might be far more costly than previously thought; accurate modeling of fugitive methane release and so of the capacity of a carbon price to limit GHG emissions from such sources would make the net positive value of F&D even higher. And yet within these strict constraints, the study shows total US emissions of carbon dioxide (CO2) would decline by 33% after just 10 years and by 52% after 20 years. In that 20 year period, total national employment increases by 2.8 million over and above projected economic expansion in the baseline scenario. This is more than a 1% increase in total US employment we don’t get without a carbon fee. The economic efficiency that leads to these rapid emissions reductions means money will flow to solutions. 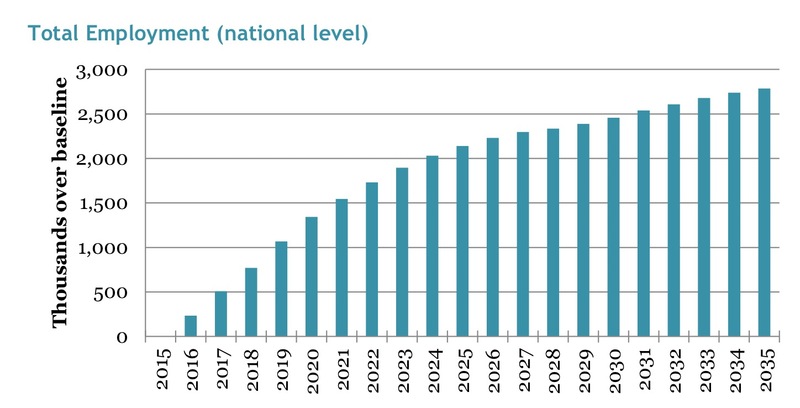 Eventually, as new technologies come to prominence electricity prices will peak in 2026, then start to decline. 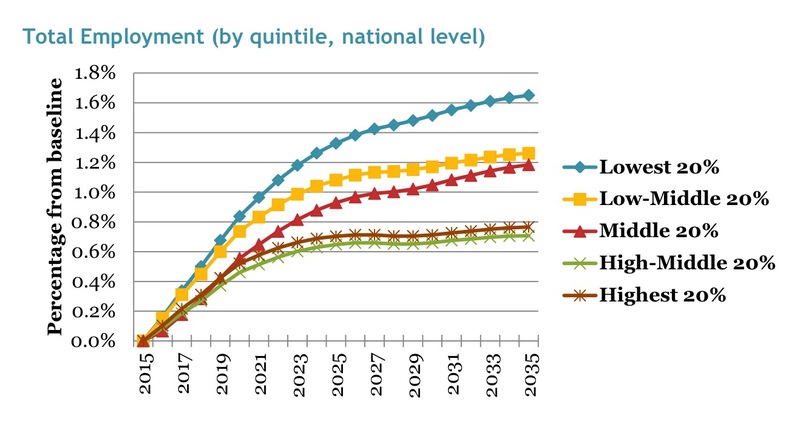 The maximum cost-of-living increase by 2035 is 1.7-2.5%, depending on region. Our power generation capacity overall expands and becomes cleaner and more cost-effective, while electricity generation from coal is phased-out by 2025. Since heavy polluting plants being taken offline also generate NOx and SOx emissions, which result in high incidence of asthma and lung disease, there is a significant measurable improvement in air quality. In all, REMI shows 13,000 lives will be saved annually after 10 years, with a total of 227,000 American lives saved over just the first 20 years of the plan. There is a significant increase in GDP of between $70 billion and $85 billion per year from 2020 on, with a cumulative increase in national GDP due to fee-and-dividend of $1.375 trillion. 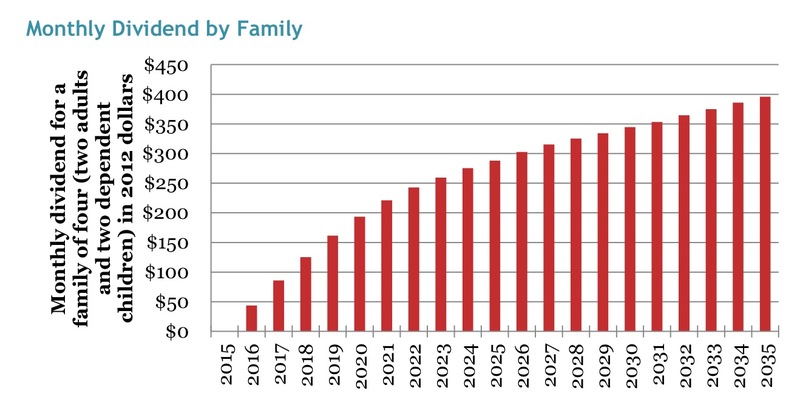 The monthly dividend for a family of four with two adults in 2025 is $288; in 2035 it’s $396. Annually, this is $3,456 per family of four in 2025. 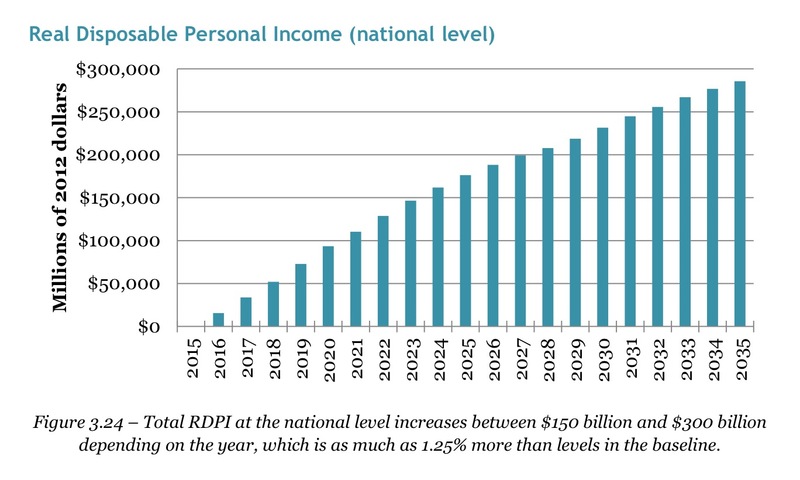 Real incomes increase by more than $500 per person in 2025. This increase accounts for cost of living increases. One of the most important findings of the report is that real disposable personal income (RDPI) increases as a result of the policy. A national increase in average RDPI means there is a clear pattern, driven by market dynamics, reducing our reliance on capital-intensive industries dominated by multinational corporations and increasing the share of our economy driven by consumer spending and local businesses that hire more workers. Those businesses include not only wind and solar as alternatives to fossil fuels, but also healthcare, retail and food services. These sectors provide a more positive feedback by hiring more people, and they also derive added benefit from the F&D economy, because they fit the spending patterns of households with newfound monthly income. What’s more, added RDPI means added income ready to be spent, adjusted for inflation. So, considering that energy and other costs are higher, income available for spending actually goes up, despite the pass-through costs from fossil fuel companies. Most people can cover pass-through costs and come out ahead. This means the true (until now hidden) costs of burning carbon emitting fuels are no longer borne by taxpayers, and consumers are not asked to bear the brunt; for the first time, fossil fuel companies and their investors will be required to carry the costs of their business model. Since the fee starts low and steadily rises, they will have time to adjust. Smart planning, along with the clarity and predictability of the carbon fee, should allow them to visualize the optimal trajectory for their transitioning of capital away from future fossil fuels and into alternative energy sources or other business lines. The REMI study shows that fee and dividend sends a clear price signal to investors and managers whose investments and decisions are burdening the rest of the economy, at present, with increasingly unmanageable costs. The worrying detail about how we are currently accounting for the cost of carbon emissions is that doing nothing is far more expensive than pricing carbon. 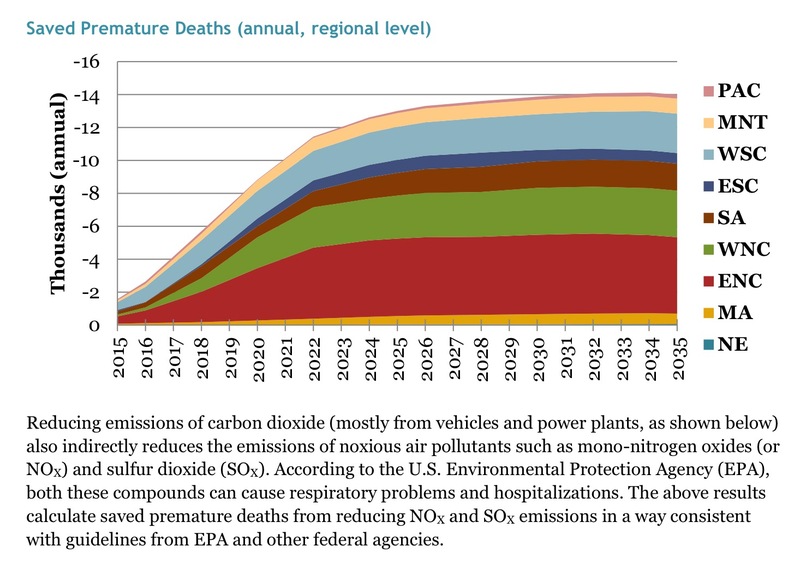 In the baseline scenario—the one where we do nothing to reduce emissions, reverse negative externalities and mitigate climate destabilization—the unmanageable costs are falling on all of us, all the time, and getting worse. Vital life support services and natural resource endowments are being eroded, because we pretend not to pay the true cost of our energy strategy. The carbon fee would not add costs; to the contrary, it would make the costs visible, so we can more easily see them, respond to them, plan around them, and phase them out. REMI’s findings show that by implementing a carbon fee and dividend plan, with 100% of revenues returned to households, we will eliminate inefficiencies, correct a dangerous market failure, and build a new economy that is healthier, freer, more resilient and more conducive to household economic empowerment.